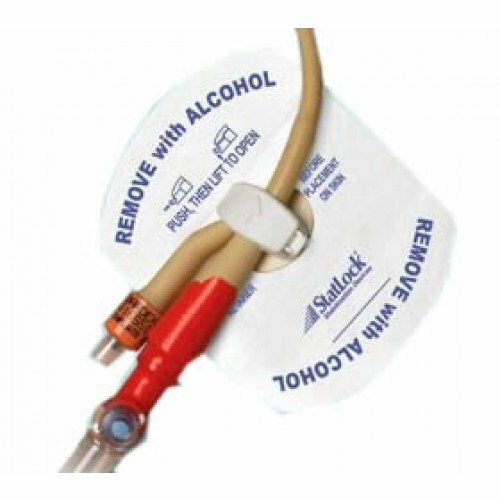 StatLock Foley Catheter Stabilization Device - Bard FOL0100, FOL0101, FOL0102. Statlock Foley Stabilization Device, manufactured by Bard, are designed to secure foley catheters in place without a leg strap. These Catheter Holders are a good alternative to strapping a catheter holder on the leg, because of the unique anchor pad design. The Latex-free anchor pad is easy to secure to the skin, preventing slipping. Anchor pads are much safer and easier to use than sutures. These anchor pads are air permeable to reduce skin irritation. The StatLock retainer device attaches to the anchor pads securing the catheter in place. The retainer device holds the catheter using transparent gull wings. To use the Bard Statlock Stabilization Device, simply lift the wings, place the catheter inside, and then close the wings over the catheter. This process is much safer and simpler than securing with sutures. The Bard statlock Foley Catheter Stabilization Device can turn on its axis 360 degrees. This is significant, because the extra movement can help to prevent accidental pulling or removal of catheters. The StatLock Catheter Holder fits most silicone or latex foley catheters. What is the difference between statlock for silicone and latex? Are they interchangeable. Don't know which catheter my husband uses? Works great and doesn't cause any skin irritation. This device is the best and safest one I've tried during two short-term catheterizations I've needed of one week or less. The only other device I've tried, with a Velcro closure, had the Velcro pad on the base tear off within a day, and that pad left behind a gluey gook on the skin that was hard to remove. 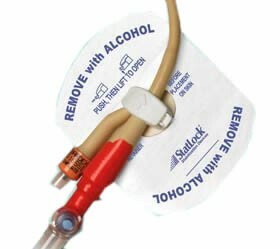 This pad has a swivel mount, a plastic snap retainer that never wears out and, when taken off with alcohol as instructed, leaves no residue behind on the skin. I just wish the pad was more waterproof. After 3-4 showers, it comes loose if I don't wrap Saran Wrap around the leg first, resulting in expensive frequent replacement, or the incovenience of wrapping the leg before each shower. Easy to apply and holds well. However the clip comes off from the adhesive backing.I'm thinking because I haven't been protecting in shower? I had a French#16 suprapubic catheter placed a few months ago and have been struggling to find an anchoring device ever since. I like the adhering strength of this device however it's "jaws" aren't large enough to accommodate this commonly used size catheter. It allows the tubing to slide thru so in a matter of minutes the cath is once again almost to my knees! We get a good life span on them also...they are placed on a stockingette material- circumference of daughter's thigh, and washed, not using the dryer. This is the best stabilizer we have used. I bought this product for my husband. Not only is it easy to attach and wear, but the swivel part adds great comfort to movement. This is the fourth foley holder I have tried and it will be my last. It adhered well and stayed in place and there was no pulling of the tube. This Catheter Stabilization device is about the third or fourth different stabilizer my husband has used. The Velcro type stabilizers seemed to slip and came lose a lot, and the other types he used the adhesive would come off in a couple of days. While in the hospital recently, he was introduced to the Statlock device and it is the best we have found! This stabilizer is comfortable, and last him about four weeks. Easy ordering, quick delivery, great price, what more could you ask for! Quick delivery service too! Exactly what I was looking for ..